I’m not going to lie. My self esteem has been really low lately. It’s been hard to look at myself in the mirror again. The pounds aren’t coming off, my pants feel a little tight from time to time, and I feel uncomfortable with my body – again? Still? But, wait, “No! It can’t be,” my brain screams, “We’re training for a marathon! We ran 20 miles last weekend alone! We burned thousands of calories! How the hell can we still be f-a-t?” Ech. Negative thoughts take on a downward spiral. 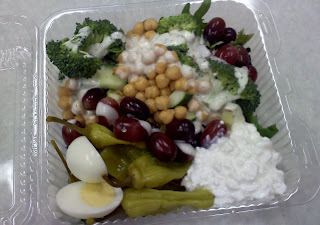 I really try to eat healthy, I really do, but when I start feeling discouraged, I start eating poorly. The old, “It doesn’t matter, so why bother?” type of thinking. Not good. My brain starts to crave the foods I think make me feel good. Refined sugars, French fries, potatoes, sugary juices, a glass of wine here and there. True, my brain might be happy, but these foods do nothing for my running performance. I eat crap, I feel like crap. Sugar equals crap. I started thinking about food – again? Still? I started thinking maybe it is not about being thin, but about being able to perform. What is thin anyway? Is it in my head? Doesn’t my husband think I am beautiful? My parents? My friends? 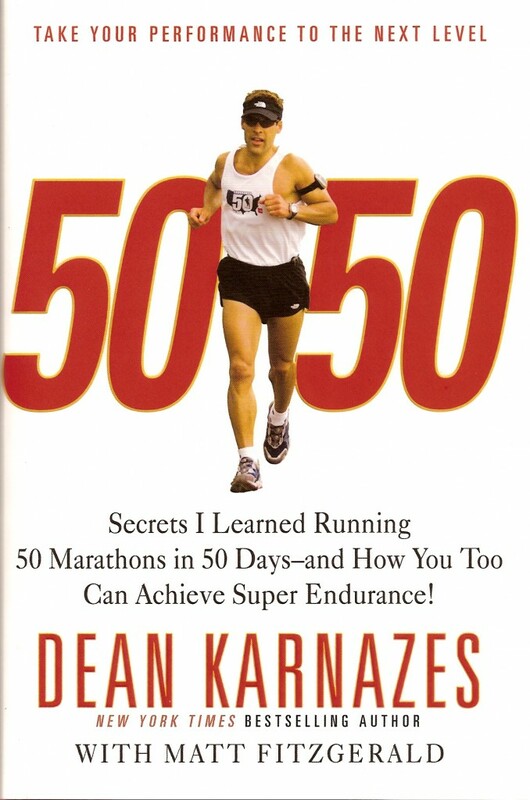 I’ve been reading 50/50 by Dean Karnazes and he talks a lot about distance running – particularly the marathon (he ran 50 of them in 50 states, in 50 days) – and I have been learning a lot. As with most superhuman-athletes, everyone wants to know what he eats, when he eats, and how much of it he eats (this is the man who has been known to occasionally order a pizza or shrimp Pad Thai during his runs). Dean writes that there is nothing magical about his everyday rules for healthy eating. He eats primarily fresh fruits, vegetables, lean meats and seafood. He limits his consumption of starchy grains to whole grains such as oats, whole wheat, and brown rice. He eats 5-6 small meals a day consisting of 400-500 calories. Extremely limited refined sugars. He eats 40 percent of his diet in carbs and 30 percent each from fats and proteins when most runners get as much as 70 percent of their daily calories from carbohydrates. Dean doesn’t carb-load. I don’t carb load. Thank God we got that all cleared up – I do not have to carb-load to be a runner. He doesn’t count calories, keep food logs or weigh himself. He eats sensibly (if a caveman has access to it, we should eat it; if not, we should not) and indulges every once in awhile in a favorite treat. By no means am I comparing my eating habits to that of Dean Karnazes, but due to my pre-existing diabetes (that I have fought off for about a year now), I can’t carb-load. Not then, not now, not ever. It’s at least nice to know that someone of respectable stature (not to mention purely awesome) also does not carb-load. I still don’t know how he does it, but I hope I can at least witness it when he runs through Columbus on his Run across America Tour this Saturday – yes! So, why am I still fat? Yeah, who knows? Rebecca and I try to figure it out all the time. I guess I have yet to find that perfect balance of calories in-calories out. For now, I need to get back on track with me eating – the last week or so has been rough. Poor self esteem leads to poor food choices. I got back on track today. That’s lettuce, spinach, broccoli, chick peas, cottage cheese, grapes, egg, peppers, cucumbers, zucchini squash, and a little dressing. Don’t get me wrong, I actually like salads, but I sometimes have trouble looking at them as a meal not just a little snack before my meal. If I have them as a meal, I have trouble finishing them. I ate this salad today (with a cup of Miso soup) and it actually filled me up. And guess what? I felt good. I love the way I feel when I fuel my body the right way. Janae does the same thing (and is a lot better about it) so you should really check out her blog for some nutritional goodness (complete with tasty treats too)! Like Dean says, he performs well and feels good after he eats nutritious foods – not poor foods. He chooses salads over fries not because he is disciplined, but because of what it does for him. He says, “The choices come easy and so do the miles when I stick to a wholesome diet.” Like Janae says, she wants to fuel her body to be the best athlete she can be. Me too, guys. Let’s get to it! AHHHH YOU MADE MY DAY!! Thank you so much for your sweet words. Girl, that salad looks absolutely amazing and I LOVE the feeling my body feels when I fuel it properly….I am always here for you when you are struggling with tough things like self esteem etc. YOU ARE SO BEAUTIFUL and keep feeding yourself enough good food:) I agree when I feel bad about myself I make bad food choices but tomorrow is a new day and you are amazing and NOT FAT!!! LOVE YOU TO DEATH and thanks again girly! I don’t have any answers either to why you/we arent’ losing weight when it seems as though we do all the right things…. But your post was inspiring to me. Thanks for posting! Nice reflection, I’m in the same boat, but I know it’s my oeverating in my case that doesn’t allow me to lose weight. But I still run and cycle and I still progress and, while I might still be chunky, I know I’m becoming more fit. One day it will all mesh, but until then, we’ll just keep trying! 1. I have problems with food, so I’m right there with you. Totally in an abusive relationship. 2. You are not fat, you are fabulous. 3. I wish my body was as awesome as yours since you ran 20 FREAKIN MILES! 4. I have no idea how you thought to put all that stuff on a salad, but it’s brilliant and I wish I could figure out how to make veggies taste good. One last thought, have you had your TSH checked recently? Maybe you need to up your Synthroid and that’s why you can’t lose weight? First huge congrats on the 20! No small task for anyone. Second I too have an ongoing battle with food, especially sugar and boredom eating out of habit. Blech. If you figure out the whole training, calories in versus out please let me know! I’ve been losing (or maintaining) for 6+ years and I’m still not at my goal weight. Now, you know where I started and just being able to SEE my shoes is a big deal compared to what WE do every week. Sure we’re no skinny, typical runner types, but that doesn’t define us. We’re out there giving it our ALL as is everyone else. Focus on the things that your body can do now compared to before. Don’t focus too much on the number on the scale; more the other things in your life.